The second mark is the gathering in, or into, the Name of Jesus. We shall afterwards have much more to learn of the need and the power of the Name of Jesus in prayer; here our Lord teaches us that the Name must be the center of union to which believers gather, the bond of union that makes them one, just as a home contains and unites all who are in it. ‘The Name of the Lord is a strong tower; the righteous runneth into it and escape.’ That Name is such a reality to those who understand and believe it, that to meet within it is to have Himself present. The love and unity of His disciples have to Jesus infinite attraction: ‘Where two or three are gathered in my Name, there am I in the midst of them.’ It is the living presence of Jesus, in the fellowship of His loving praying disciples that gives united prayer its power. What an unspeakable privilege this of united prayer is, and what a power it might be. If the believing husband and wife knew that they were joined together in the Name of Jesus to experience His presence and power in united prayer (1 Peter); if friends believed what mighty help two or three praying in concert could give each other; if in every prayer meeting the coming together in the Name, the faith in the Presence, and the expectation of the answer, stood in the foreground; if in every Church united effectual prayer were regarded as one of the chief purposes for which they are banded together, the highest exercise of their power as a Church; if in the Church universal the coming of the kingdom, the coming of the King Himself, first in the mighty outpouring of His Holy Spirit, then in His own glorious person, were really matter of unceasing united crying to God;–O who can say what blessing might come to, and through, those who thus agreed to prove God in the fulfilment of His promise. In the Apostle Paul we see very distinctly what a reality his faith in the power of united prayer was. To the Romans he writes (25:30): ‘I beseech you, brethren, by the love of the Spirit that ye strive together with me in your prayer to God for me.’ He expects in answer to be delivered from his enemies, and to be prospered in his work. To the Corinthians (2 Cor. 1:11), ‘God will still deliver us, ye also helping together on our behalf by your supplications;’ their prayer is to have a real share in his deliverance. To the Ephesians he writes: ‘With all prayer and supplication praying at all seasons in the Spirit for all the saints and on my behalf that utterance may be given unto me.’ His power and success in his ministry he makes to depend on their prayers. With the Philippians (1:19) he expects that his trials will turn to his salvation and the progress of the gospel ‘through your supplications and the supply of the spirit of Jesus Christ. ; To the Colossians (4:3) he adds to the injunction to continue steadfast in prayer: ‘Withal praying for us too, that God may open unto us a door for the word.’ And to the Thessalonians (2 Thess. 3:1) he writes: ‘Finally, brethren, pray for us, that the word of the Lord may run and be glorified, and that we may be delivered from unreasonable men.’ It is everywhere evident that Paul felt himself the member of a body, on the sympathy and co-operation of which he was dependent, and that he counted on the prayers of these Churches to gain for him, what otherwise might not be given. The prayers of the Church were to him as real a factor in the work of the kingdom, as the power of God. We cannot sufficiently thank God for the blessed week of united prayer, with which Christendom in our days opens every year. As proof of our unity and our faith in the power of united prayer, as a training-school for the enlargement of our hearts to take in all the needs of the Church universal, as a help to united persevering prayer, it is of unspeakable value. But very especially as a stimulus to continued union in prayer in the smaller circles, its blessing has been great. And it will become even greater, as God’s people recognize what it is, all to meet as one in the Name of Jesus to have His presence in the midst of a body all united in the Holy Spirit, and boldly to claim the promise that it shall be done of the Father what they agree to ask. O Father! we pray for Thy people, and for every smaller circle of those who meet together, that they may be one. Remove, we pray, all selfishness and self-interest, all narrowness of heart and estrangement, by which that unity is hindered. Cast out the spirit of the world and the flesh, through which Thy promise loses all its power. O let the thought of Thy presence and the Father’s favor draw us all nearer to each other. 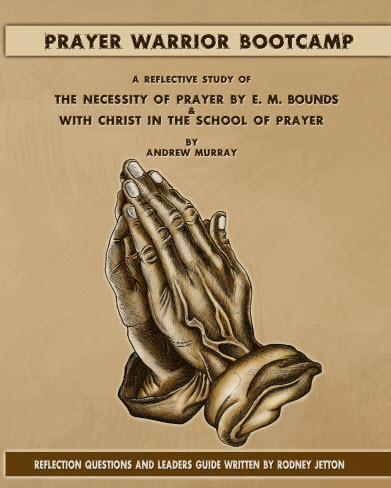 Murray says we need both secret solitary prayer and ___________________________, ________________________ prayer. Murray points out that the focus of our prayer meeting should be ____________________________ ___________________________________________________________________________.